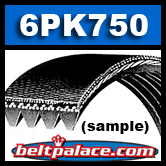 6PK750 Serpentine Belt. Best for small diameter pulleys, backside idlers and automatic tensioners. Eliminates noise, reduces tension loss and solves problem drives. Tensile members and rib reinforcement added for wear and cracking resistance. Meets or exceeds SAE J1459 specifications.